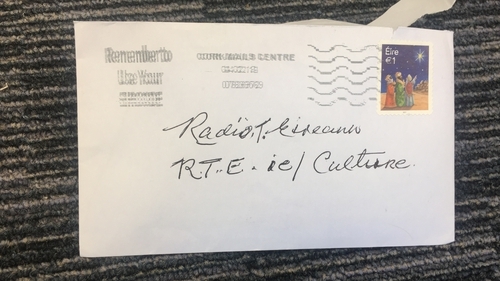 I can ping you a WhatApp in seconds and 'like' your status with a flick of my thumb, but there is still nothing as personal as a handwritten letter, so we here at RTÉ Culture were delighted to receive one this week, in beautiful script too! The writer, a Kerry woman in her 94th year, wanted to share her thoughts on her favorite song with us. 'My Way' is a compelling, beautiful melody, she tells us, telling a 'real human story' and she recommends it to all listeners, particularly young people who might take courage and consolation from it. This is a compelling, beautiful melody, lovely lyrics, it tells a real human story, it gives courage, drive and determination to its listeners, denotes no one fails, you dust yourself off and start again. I can listen to this melody over and over again. Each time I get courage to keep going, no matter my frame of mind. In this age of technology, young people should listen to this song and take courage and consolation, to distance themselves from this world of sound and fury' signifying nothing! For the record, I'm in my 94th year. We here at RTÉ Culture love getting feedback from readers, and you can of course reach us at culture@rte.ie. And that's exactly what this lady did - by addressing her envelope to rte.ie/culture. It got here too!